Shortcut Cleaner developed by Grinler fron Bleepingcomputer is a small utility designed to fix hijacked of modified shortcuts by potentially unwanted programs, adware or other malicious software. This utility will scan your windows shortcuts and browser shortcuts belongs to Internet Explorer, Mozilla Firefox, Google Chrome and other browser for malicious modifications. If shortcutcleaner found hijacked shortcuts it will will automatically clean them by removing the malicious hyperlink that was insert in the shortcut. There are various browserhijackers that modifies the browser shortcuts with a malcious link, when you start your browser the shortcut will redirect to the executable belongs tot the browser but because they are hijacked with al malicious link it will also display a other website instead of your startpage. Known variants that are hijacking the browser shortcuts with malicious links are. Download Shortcutcleaner to your desktop. Right click on “sc-cleaner.exe” and choose run as administrator, Windows XP user can just doubleclick on sc-cleaner.exe to start the program. Know the tool wil scan all the windows en shortcuts they belong to your installed browsers. If the tool detects hijacked shortcuts, it will automatically clean them. When the tool is ready, it will save a log file on your desktop, this file contains the information of the scanned and repaired shortcuts. After running SC Cleaner scan also your system with Malwarebytes Anti-Malware en AdwCleaner. Be sure that everything is Checked and click on Remove Selected. Malwarebytes Anti-Malware need to restart your system to remove te detected items, so please restart the system immediately. Important! Before starting AdCleaner, close all your open programs and internet browsers. Double click on adwcleaner.exe to start te tool. 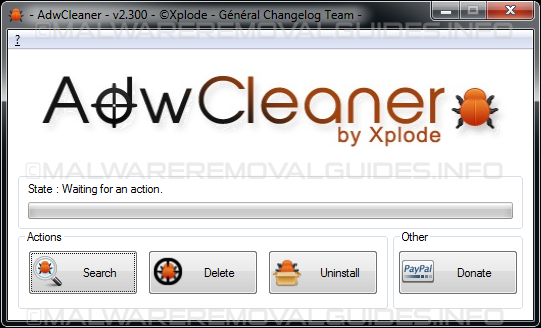 Click on the Delete button, then confirm each time with Ok.
NEXT, double click again on adwcleaner.exe to run the tool.